Have you ever imagine celebrating your birthday without a pansit (noodle) on the table. Well that’s a big mortal sin for the Filipinos. For no birthdays or family gathering is complete without a pancit on the table. A sign of longevity and strong family ties. Definitely we owe this to strong chinese influence but our version is truly filipino in its sense. Pancit could be long or short, with sauce or not but always a sure hit among the guests. I love it in between my pandesal in the morning or eaten with rice during lunchtime. *1 kilo could serve about ten to twelve guests. But it depends on their capacity to eat and if there are other dishes on the table. There are many versions of cooking canton. This one is the version of my friend’s mom she taught us, and I swear its really good. In a big wok or sautéing pan, put the pork and half a cup of water. Cover it and let it boil. After few minutes of simmering you can take now the liquid from the wok. You will save it for future use later. Add oil on the wok and start frying the pork, once they change color, take them off and put the shrimps. Cook them lightly until they change color. Next put the squid balls and do the same. After all these fry all the vegetables lighlty. You can add more oil if necessary. The vegetables need to rest crunchy and sweet. Reserve in one big plate all the fried vegetables, pork, shrimp, squid balls and cooked chicken breast. On the same wok, sauté the garlic and onion and pour the pork broth cube dissolved in water. Let it boil. Add the pancit canton. Pour the soy sauce. Do not put everything immediately, try to taste it, to determine whether you will need to put more or less. Let the canton noodles soften and absorbed the juice. If you like your pancit canton with a little bit of liquid you can already turn off the fire as soon as the noodles tenderized. But if you prefer a pancit canton drier you need to wait that the juice have already evaporated. But do not overcook because noodles have tendency to become soggy. At this point mix half of all the fried ingredients you have on the pancit. Mix them well to be sure they are proportionally distributed everywhere. 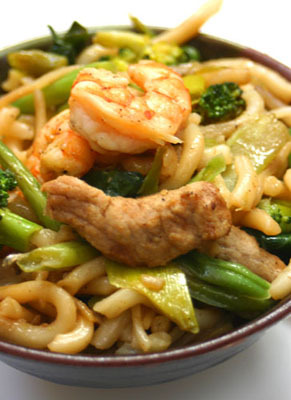 The other remaining half of your fried veggies and meat goes on top of the noodles so that it will look more appetizing. Serve with kalamansi (lemon or lime) mixed with soy sauce and siling labuyo (chili hot pepper).